In an interview to ANI, he dismissed claims by some political pundits that the BJP might not get more than 180 out of 543 seats in the Lok Sabha elections, saying there were a similar "set of persons" who echoed a similar narrative even in 2014. The Prime Minister was responding to a question whether people had now considered the 'Mahagathbandhan' to be an alternative to Modi. He expressed confidence that the people will again repose faith in the BJP considering the work done by his government over the last four and a half years. "I believe, this election is going to be a contest between those who fulfil and take forward the aspirations of the people and those who stop these aspirations. There is experience of 70 years. The public is the decider," the Prime Minister said when asked if the 2019 elections were heading towards a US Presidential style of elections between Modi VS Rahul. Asked whether the upcoming Lok Sabha polls would be "anybody but Modi' contest as projected by the opposition parties, he said, "It is going to be 'janta (public) versus gathbandhan (coalition). Modi is just a manifestation of public love and blessings," he added. 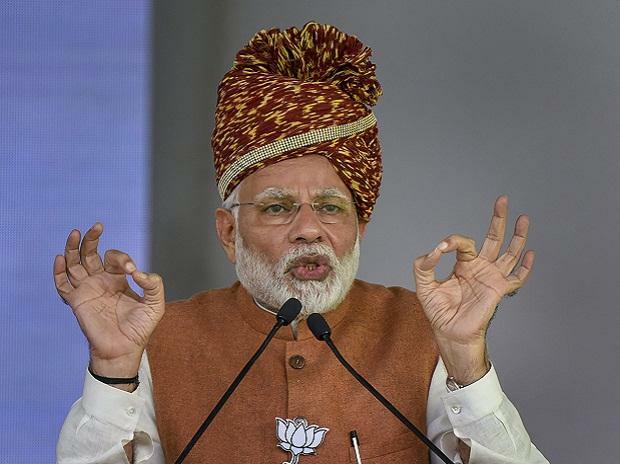 PM Modi's attention was drawn to allegation by Andhra Pradesh Chief Minister and TDP leader Chandrababu Naidu that the efforts being made by Telangana Chief Minister and TRS supremo K Chandrashekar Rao to form an alliance has the blessings of Modi. "I am not aware that some coalition is being made by KCR," Modi replied. The Prime Minister was also asked about the unhappiness expressed by some of the BJP allies, like Shiv Sena, from time to time and whether they were indulging in "muscle flexing". In his response, he said, "Sometimes, some expectations are not met" and some allies feel that they "could benefit by putting pressure" on the BJP. "Some (allies) feel that such issues could be resolved through discussions.... But our effort is to take everyone along and listen to everyone," Modi added. He emphasised that he was "committed to give importance to regional aspirations" as he believes that the country cannot be run by ignoring regional aspirations. "That is why BJP is more successful." "Even today when we run the government, there is consensus in decision-making," he said. "It is true that states have their own level of politics. Our allies wish to grow and we too want them to grow. We do not want that we should grow at the cost of allies," Modi added. Asked whether there was any move of film stars-turned-politicians Rajnikanth and Kamala Hassan to join the NDA and improve the NDA'S footprint in South India , he said, "We are continuously striving to expand our base. We are ready to take everyone along, those who want to come with us, those with whom we can walk. It is linked to our strengthening the regional aspirations.